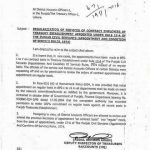 Govt of Punjab Service and General Administration Department (Regulation Wing) has issued Notification No. 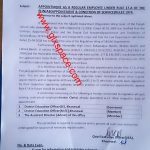 DS (O&M)(S & GAD)5-3/2013 dated 2nd March 2013 in connection with the Appointment of Contractees in BPS-16 and above on Regular Basis in Autonomous Bodies. (a) A regular vacancy is available for appointment of contractee on regular basis. (b) Appointments were made after advertisement of the vacancies in newspapers, and in prescribed manner. 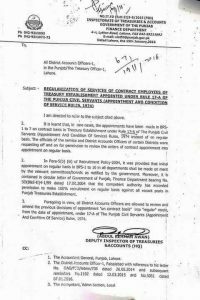 (c) The appointment of contractee was made as per provision of the relevant service rules. In case no such rules have been framed, the same should be framed before consideration of appointment of contractee on regular basis. 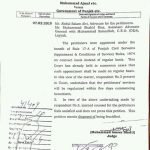 (d) The contractee is domiciled of Province of the Punjab. (e) The appointment on regular basis shall be subject to the verification of character and antecedents of the contractee to the satisfaction of the appointing authority. (f) The contractee, being considered for regular appointment, must be in good mental and bodily health and free from any physical defect likely to interfere with the discharge of his duties. A candidate who, after such medical examination as prescribed by the respective autonomous body, is declared as ‘not fit’ by the examination authority, shall not be appointed on regular basis. (g) Performance of the Contractees remained satisfactory during the contract period. (h) The Appointing Authorities may ensure that the degrees, diplomas, certificates or other relevant documents required for appointment are not bogus/ forged. After scrutiny of the cases, the recommendations of the committee shall be sent to the respective appointing authority in the concerned Autonomous Body for appointment on regular basis of the Contractees. The appointment on regular basis shall be made with ‘immediate effect’ by the concerned Appointment Authorities. (A Post by Makhdoom Sultan). 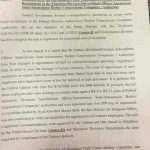 Dear hm log 2012 men contract py ay or hmary letter py likha tha k en py ppsc naheen lgta.pehly hm TEVTA men thy 17 grade men. To Kia regular honey k let ppsc lgy ga.
what about Lecturer who are salect through PPSC and some college are not include in autonomous bodies please tell me. 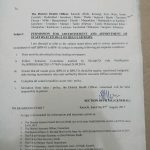 Mam shumaila those employees who are not appointed through proper vacancy in university will they be regularise or not? plz reply.because i am in scale 16 and my appointment is not through vacancy announced in newspaper ..
Dear Aysha, I m not confirm, just contact the university authorities. SSE are included in autonomous bodies or not? DEar Yasir, Not Confirm about SSE included or not in AB. main karachi ka rehne wala hn mai srif apna nahi kehrah sb ka kehrah hn. contract wale mustakil hogye magar hm daily wages wale kiu nahi hue kia hm gharib nahi hai kia hm roti nhi khte kia hm majbur nahi hai. Dear Aqeel there are many departments included in autonomous body i.e universities, some colleges, Education Boards etc. U can see the full list of autonomous bodies by searching in Google. SSE are included or not? Kindly tell me about SSEs of school education depratment BPS-16???????? kindly inform if the SSEs going to be regular or not . Dear Nauman Sarwer Just right click on the picture of the Notification and then save Image as. 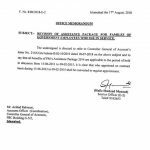 Its mean shumaila je education department waly jo bps 16 pe hn like sse woh e.d.o n dco ke janib se permanent hn gy. Shumaila behn as these are also of grade 16 and above employees. so where is the condition of PPSC?? It means it will be implemented by your own department in which you are working. Because there is a word may be refer to PPSC is used. Dear Moin I m not working in this department.